Movie-going in Thailand is alive and well. Just take a look at the glut of costly Hollywood blockbusters that routinely edge out domestic productions for screen time. If the market were weak, it's doubtful that Hollywood would go through the effort. 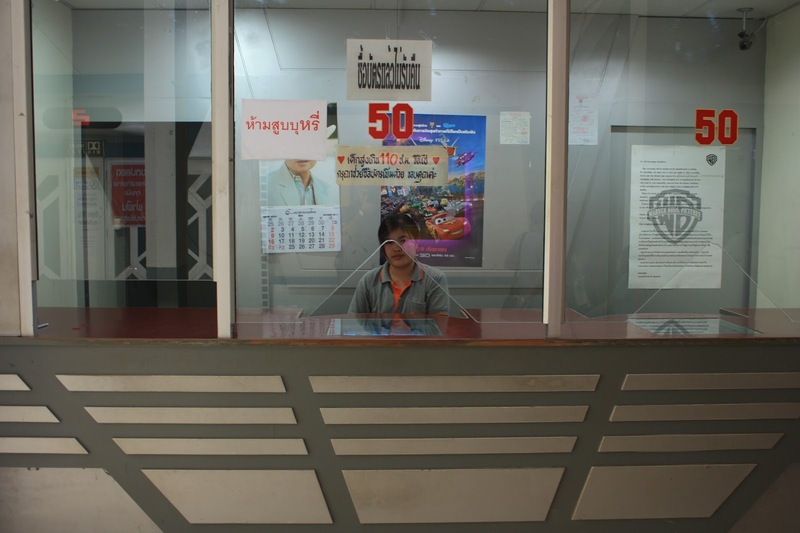 Hollywood dominance at the Thai box-office is ensured by arrangements with local chain exhibitors and their powerful distribution arms, keeping theaters stocked with American product. With the ability to stifle competition by outspending the little guy in every aspect, or supplying them with movies unsuitable for local tastes, the chain theaters have all but cornered the Thai movie-going market. Paramount to this movie-watching paradigm shift has been a drastic change in the form and architecture of movie theaters. Across the country, the mammoth single screen theaters built during the 20th century have gradually given way to the multiplex variety, a trend typical in most fully or newly industrialized countries. In town after town, locally owned stand-alone theaters have either closed, or clung to life by sheer determination. But in Thailand's northeast, at least, local movie exhibitors still hold their own.The Prince Cineplex in Kalasin is one among over a dozen Isan Theaters that has bucked the trend. A weekday afternoon spent exploring it gave some clues as to why. Though looking a bit shabby from the outside, the Prince abounds with inner virtues that help it stay in the game. In the realm of comforts, it is in league with anything the highly capitalized multiplex chains are equipped with, short of the exclusive box seating popular among the pampered Bangkok elite. 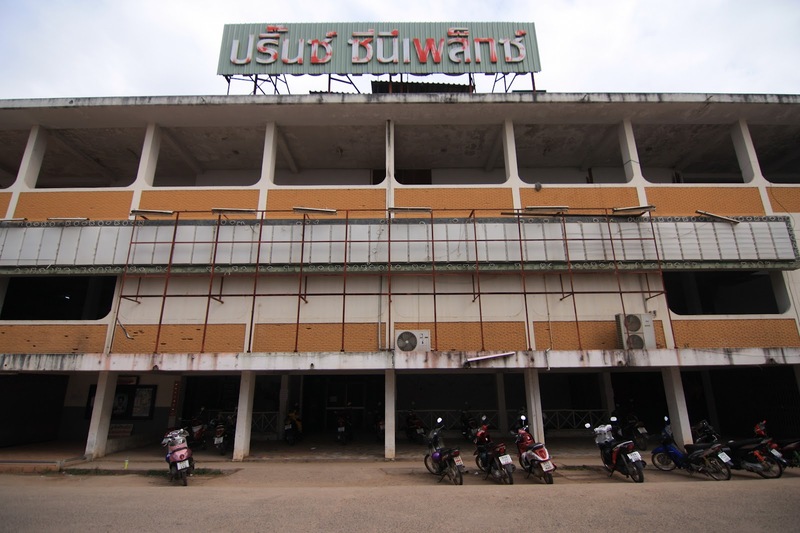 When it was built in the early 1970's under the name of the Kalasin Rama, the Prince had a single, enormous screen and a seating capacity in the range of 1,000. 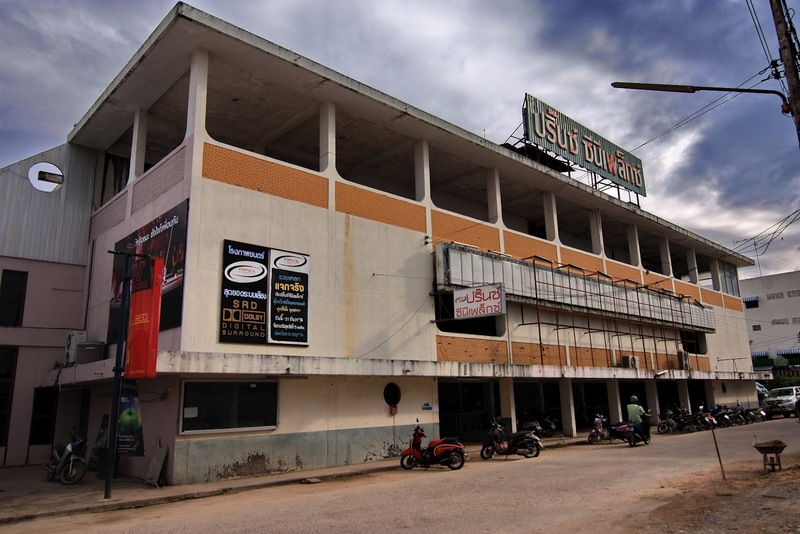 In the late 1990's, the Khon Kaen-based Prince purchased the old Kalasin Rama and turned its giant auditorium into two smaller ones - a procedure which allowed them to diversify the film fair shown at any given time and attract a wider audience. As the new and improved Prince Cineplex boomed, it siphoned ticket sales from other Kalasin theaters, including the older, smaller, but much prettier Lak Meuang Cinema. When questioned about why an elegant theater like the Lak Meuang had gone out of business, Prince manager Mr. Preecha responded glibly, "because of us." 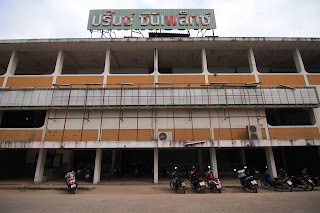 Behind the current sign stands the original cut-out letters announcing the Kalasin Rama. Indeed, with no competitors in the market, the Prince Cineplex does brisk business. 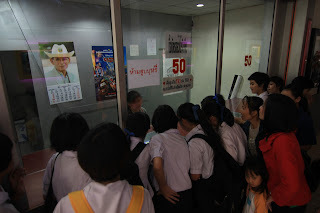 On a Friday afternoon, I found the Prince's open-air lobby flooded with teens and adolescents, most still in school uniform, waiting to see the latest hits. Giddy teen laughter rippled through the theater during the screening of the Thai romantic comedy "30+ Singles on Sale." Yet behind the sounds of youthful joy, the din of coming doom can be heard - ever so slightly - creeping through the paddy fields. A relic from a bygone era: the movie trailer truck, still in use at the Prince Cineplex. In the wake of Thailand's industry-crippling floods of 2011, rumors are circulating about a master plan to relocate Thailand's industrial belt to the Northeast. An integrated highway system and lots of open land makes the Northeast - in the minds of country planners - ideal for hosting the country's lucrative industrial complexes. And with fewer waterways than the central plains, flooding should be much less of a concern. If these plans are enacted, Isan, as the Northeast is colloquially known, will become flooded with investments. Though good for the wallets of local strongmen and, perhaps, industrial laborers, mom and pop businesses will likely face economic hardship, as the national chains seek to capitalize on the region's new-found wealth. Isan's collection of independently owned theaters, then, will likely go the way of their ilk in all other parts of the country. But for now the Prince Cineplex is alive and well, providing cinematic entertainment to the youth of Kalasin one screening after another.